"Succulent, moist, and depending on the whisky you use, smoky, peaty, or grainy. The whisky adds a certain depth to the meat, even if you don't like whisky (and I don't!!!). Try this recipe; you can't taste the alcohol, just the smoky character of the whisky. Serve with game chips or tatties-an-neeps." 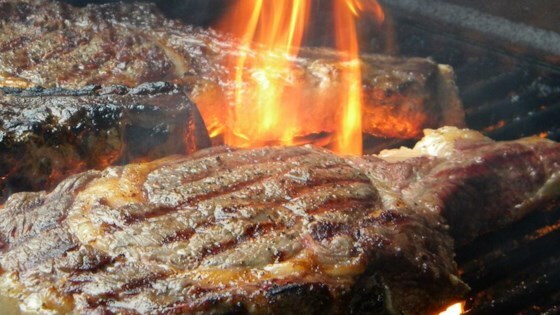 Place steaks in a nonmetallic dish, and pour the whiskey over the meat; turn to coat. Cover, and marinate in the refrigerator for 8 hours. Brush grate with oil, and arrange steaks over hot grate. Cook for 6 to 10 minutes. Turn, and cook until done to your liking, another 6 to 10 minutes. I marinaded in whisky for 12 hours and marinade over powered the steak. Also, needs other seasonings. This one will not go into my recipe box.